Exedy's Stage 4 Twin Disc Clutch Kit for your Evo 8/9 is designed for multi-use - street action as well as drag, road, and rally racing. 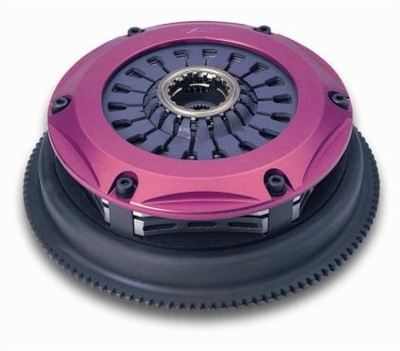 Exedy's Twin Disc Clutch Kit includes a lightweight Chromoly steel flywheel, and their famous purple anodized forged aluminum clutch cover. All clutch kits includes T5001 cerametallic friction materials for extreme heat resistance. For 5 and 6 speed applications. **This clutch kit does not include a replacement Throw Out Bearing (TOB) or Clutch Fork Stop. We recommend adding those parts to your cart when purchasing this clutch kit. Designed for high-powered applications, Exedy's Twin Disc Clutch Kits are a perfect fit for those wanting performance for both track and street use.